What is there that I could possibly say that hasn't already been said all over the Internet since Saturday's debacle? Probably nothing, so there's no point in rehashing it all. A result tonight would go a very long way in repairing the feelings we all have about this team at this moment, but it's a long shot. Stranger things have happened. Perhaps Bayern will treat Arsenal like Arsenal treated Blackburn? One can hope, right? Right? Accumulation Trouble: Koscielny and Cazorla each face a one match ban with their next yellow card. a captain's armband. Is he captain of the ballboys? There are two main stories within the squad news right now. The makeshift defense will be a major discussion, especially if Arsenal loses by a lopsided scoreline. But, the real onus is on the midfield trio of Mikel Arteta, Jack Wilshere, and Santi Cazorla to dictate the play. The slapped together defense will be less of a story (and less of a factor) if Arsenal's midfield gets the better of Bayern's (on paper, it's hard to say that will happen, but let's be optimistic for some reason.) Jack Wilshere's going to have to put in a performance like he did against Barcelona two years ago. And even that alone might not be enough. In 2006, both Gael Clichy and Ashley Cole were hurt at one point and Arsenal still went to the final. Have you looked at the back four that played against Real Madrid in the Round of 16 that year? It was Emmanuel Eboue, Kolo Toure, Philippe Senderos, and Mathieu Flamini. Arsenal have done it with a makeshift back four before. Accumulation Trouble: Dante, Schweinsteiger, and Martinez each face a one match ban with their next yellow card. Bayern Munich have no major injury concerns to contend with, though center back Jerome Boateng will miss both legs of the tie after being sent off on Matchday 6. Much of the focus will be on Bayern's midfield trio (Javi Martinez, Bastian Schweinsteiger, and Toni Kroos) and how they play against Arteta, Wilshere, and Cazorla. Both Martinez and Schweinsteiger are in yellow card trouble; both could be suspended for the second leg if they are booked tonight. Center bank Dante is also in yellow card trouble; that's even more dangerous for Bayern, considering Boateng is already suspended. Bayern have the pacey Austria international David Alaba at left back and he certainly has the speed and acceleration to deal with Theo Walcott. Thomas Muller or Arjen Robben will attack down the right flank against Arsenal's makeshift left side, while Lukas Podolski will deal with Germany's captain, Philipp Lahm, down Arsenal's left flank. Oh, and there's the matter of world class Manuel Neuer in goal, too. seasons. The sides played a 1-1 draw in December. How much is there to really say about Arsenal's form? The progress made through those two hard fought victories over Stoke and Sunderland from the previous two weeks was almost entirely undone by losing 1-0 at home to a Championship side. 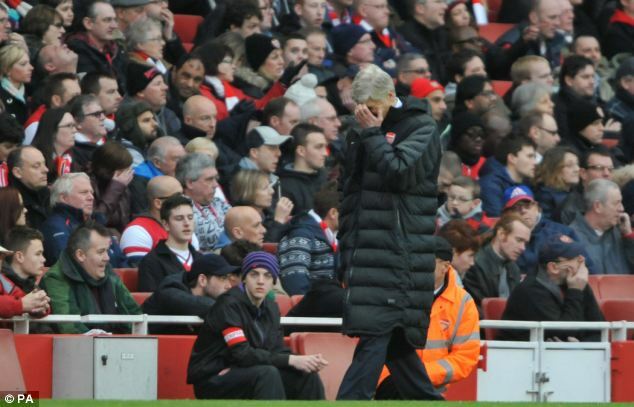 The Gunners, in terms of form, are still wobbly, at best. And so, let's talk about the season Bayern Munich is having. It's staggering. They have lost twice, across all competitions. Last season was particularly difficult to swallow, losing the Champions League final (at home) after coming so close to winning it, while also conceding a domestic Double to Borussia Dortmund. Bayern Munich came in second place in all three competitions last year. Through 22 matches in the Bundesliga this year, Bayern Munich is 15 points clear (comparatively, Manchester United and Barcelona are both 12 points clear in their respectively leagues; it's insane how noncompetitive the top three leagues in Europe are this season.) They have not dropped points since before Germany's winter break, last failing to win against Borussia Monchengladbach on December 14. Their only league loss (which was at home) came on October 28, to Bayer Leverkusen. They also lost in the Champions League, surprisingly, at BATE Borisov in Belarus, on October 2. Next Wednesday, Bayern Munich will host Borussia Dortmund in a DFB-Pokal (the German Cup) quarterfinal, as they will look for revenge from last year's 5-2 loss in the final. first leg of the 2005 Round of 16. Arsenal have met Bayern Munich twice before in the Champions League: in the 2000/01 second group stage and in the 2005 Round of 16. The Bavarians got the better of the Gunners on both occasions overall, going on to win the competition in 2001. In 2000/01, both Arsenal and Bayern advanced from the second group stage, as Bayern took four of a possible six points from Arsenal. Arsenal lost in Germany on Matchday 6 and advanced only because Lyon was unable to win in Moscow against Spartak. In the first meeting, on Matchday 2 in London, Arsenal led 2-0 through Thierry Henry and Kanu, but conceded twice in the second half to draw 2-2. On Matchday 6, Arsenal lost 1-0 in Germany, via a 10th minute goal by Elber. In the 2005 Round of 16, Arsenal lost the first leg 3-1 in Germany. Bayern jumped out to a 3-0 lead, with a brace from Claudio Pizarro and a goal from Hasan Salihamidzic. Arsenal grabbed a huge away goal in the 88th minute, though, from Kolo Toure. Arsenal, therefore, needed to win 2-0 at home in the second leg to advance on away goals. Thierry Henry finally got the first in the 66th minute, but Arsenal never found the second. Arsenal won the match 1-0, but lost the tie 3-2 on aggregate. The match officials are from Norway; the referee is Svein Oddvar Moen. Arsenal have seen Oddvar Moen twice over the past three seasons; both encounters were at the Emirates and both were Arsenal victories. On Matchday 2 earlier this year, he took charge of Arsenal's 3-1 win over Olympiacos. In 2010, he was in the middle of Arsenal's 5-1 win over Shakhtar Donetsk. Bayern Munich have only seen Moen once, though that match was the deepest into the tournament Moen has worked. It was in last year's quarterfinal, as Bayern defeated Marseille 2-0 at Allianz Arena. Note that the home side is yet to win in any of the knockout phase matches already played.